In many cultures, celebrants host bonfires to keep the celebration going long after the sun goes down on the summer solstice. The summer solstice is the longest day of the year — at least in terms of sunshine. People have celebrated and enjoyed this day for centuries, and the tradition has managed to cross civilizations, cultures, and geographic borders. In the northern hemisphere, it occurs on June 21 or 22, while in the Southern hemisphere, it happens on December 21 or 22. If you're curious about this holiday's history and customs, here are a few fun facts. 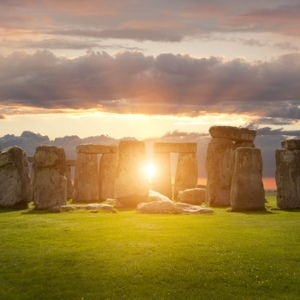 Sometimes called Litha, the summer solstice has a history that dates back to several ancient civilizations, including the Romans, Greeks, and Chinese. It's agriculturally significant because it falls at a time when all of the crops have been planted, which means that farmers no longer have heavy workloads. Ancient cultures also used the solstice to worship their gods. Light and dark have long served as symbols of life and death, respectively. On the longest day of the year, life metaphorically manages to conquer death, which has inspired celebrations among many cultures. However, light also suggests many other forms of symbolism, such as growth, renewal, discovery, and rebirth. Cultures have historically associated the summer solstice with two specific elements: fire and water. These elements suggest a certain polarity by themselves — water extinguishes fire, for instance. This could reflect the double-edged sword that the summer solstice represents. While it's the longest day of sunlight, it's also the moment when the days begin to grow shorter as winter approaches. Because of the sun's longevity in the sky on this day, the summer solstice provides the perfect opportunity to get outdoors and enjoy nature. Whether you're throwing a massive party or taking your kids to the park for a short hike, spending time outside is an excellent way to find peace and to practice gratitude. It's also a chance to feel more connected — both to nature and to the people around you. The changing seasons are among the most powerful events throughout the year, and along with the winter solstice, the summer solstice is the most noticeable because of the sharp changes in weather patterns and temperature. In several cultures, the masculine aspect of deity makes its presence known during the summer solstice, while the winter solstice is reserved primarily for the celebration of feminine qualities. Many people use this time for personal development, whether they're correcting a mistake, pursuing a new activity, or learning a fresh skill. You might use the summer solstice as a time for reflection and growth. Get in touch with your personal needs through a numerology reading or tarot reading, for instance. Align yourself with your values, beliefs, and goals, so you can feel more fulfilled throughout the rest of the year. No matter your religious affiliation or spiritual beliefs, the summer solstice can prove transformative if you choose to celebrate it. Its roots in ancient culture and tradition can inform the ways you honor it today.